At top, Fireman Guy Montag (Lucas Rolf) and his wife Mildred (Savanna James) argue about his reading and keeping books, in a tense atmosphere caused by sounds of the Mechanical Hound, a robotic hunter that will kill those with books, scratching at the door. In the background is Faber, a retired English professor played by John Pressley Wright, who has influenced Montag’s desire to read. Below, members of the “Fahrenheit 451” cast toured the Paris Fire Department Station #1 to see what life is like for a fireman. Shown demonstrating how to put on gear is Kyler Bramhall with, from left, Drew Boren, Lucas Rolf, Stoney Musgrove, Javian Dabbs, Chaston Tomlin, and Connor Bridges. 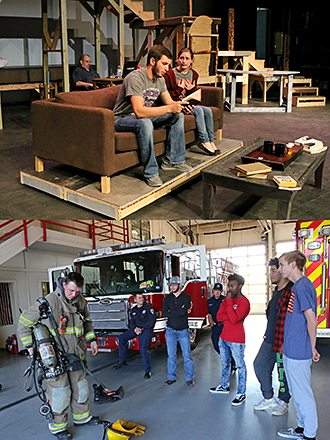 Fahrenheit 451 is the first production in the Paris Junior College Department of Drama’s “Season of the Elements.” The play runs from Thursday, Oct. 4 through Saturday, Oct. 6 at 7:30 p.m., and at 2:30 p.m. on Sunday, Oct. 7 in the Ray E. Karrer Theater. Representing the element of “Fire,” Fahrenheit 451 is Ray Bradbury’s science fiction classic in which reading books is illegal, and firemen start fires instead of fighting them. The story follows fireman Guy Montag as he meets a cast of colorful characters and takes part in events that make him question his chosen profession burning books. Will he escape a dystopian future in which electronics and televised entertainment are the highlights of life to become a free-thinking reader? Tickets are $15 general admission, $10 for children under 18, $5 if accompanied by a new children’s book for local charities; and free for those with a current PJC ID. Montag - Lucas Rolf; Black - Javian Dabbs; Holden - Connor Bridges; Henley - Chaston Tomlin; Beatty - Trent Fells; Clarisse - Grace Marie Hignight; First Paramedic - Dee Shepard; Second Paramedic - Carolyn Bell (Candace Weist is understudy); Mildred - Savanna James; Mrs. Hudson - Lisa Martin; Faber - John Presley Wright; Alice - Hannah England; Helen - Molly Law. Book People: Aristotle - Don Bates; Tolkein - Terry Lugo; Bronte - Lynnae Hernandez; Rostand - Dr. Marian Ellis; Dostoevski - Steven McClain; Saint-Exupéry - Tayler Kruse; Tolstoy - Lorelei McClain; Wilde - Diann Mason ; Carroll - Chasidy Trantham; Plato - Raden Phillips; Melville - Gary O’Connor; Robert Louis Stevenson - “D.B.” Daniel Bolton; Dickinson - Dr. Jennifer Collar, Melissa Arnold, Helen Mosher, Brenna Mills, Jayla Oldfield, Dr. Pamela Anglin; Frost - Kathleen Hays; Hemingway - Angeli Hartleip; Julius Caesar - Candace Weist; Hamlet - Jimmie Sanders; Melville 2 - Emily O’Connor. Swings; “Voices,” TV Wall Family: Gisselle Benitez, Inga Hodge, Carlton Bell, Chaston Tomlin.